My buddy and fellow dabbler in the written arts, Jason G. Anderson, recently had some problems with his Amazon account. Everything is now fixed, and to celebrate the good news he has decided to have a 5 day sale for his novel, Gears of Wonderland. Normally priced at $2.99, you can now grab it for just 99 cents. 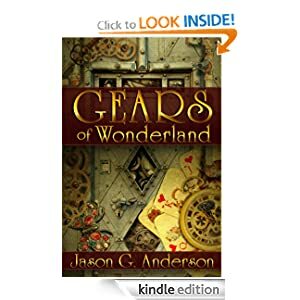 Gears of Wonderland is set 150 years after the original Alice novels, in a land that has changed significantly from the one Lewis Carol wrote. Many of the old characters are present (the Mad Hatter, the Cheshire Cat, the Knave of Hearts, to name just a few), but many new characters join the world (for example, Kara Hatter, the Mad Hatters daughter, and Taxard, a mechanical assassin). If you enjoy steampunk and the original Wonderland stories, be sure to take a look. Jason’s reviews are all exceptionally flattering.